Music is found in every known culture, past and present, varying wildly between times and places. Around 50,000 years ago, early modern humans began to disperse from Africa, reaching all the habitable continents. Since all people of the world, including the most isolated tribal groups, have a form of music, scientists conclude that music is likely to have been present in the ancestral population prior to the dispersal of humans around the world. Consequently music may have been in existence for at least 50,000 years and the first music may have been invented in Africa and then evolved to become a fundamental constituent of human life. Prehistoric music, once more commonly called primitive music, is the name given to all music produced in preliterate cultures (prehistory), beginning somewhere in very late geological history. Prehistoric music is followed by ancient music in most of Europe (1500 BCE) and later musics in subsequent European-influenced areas, but still exists in isolated areas. Prehistoric music thus technically includes all of the world's music that has existed before the advent of any currently extant historical sources concerning that music, for example, traditional Native American music of preliterate tribes and Australian Aboriginal music. However, it is more common to refer to the "prehistoric" music of non-European continents – especially that which still survives – as folk, indigenous or traditional music. The origin of music is unknown as it occurred prior to the advent of recorded history. Some suggest that the origin of music likely stems from naturally occurring sounds and rhythms. Human music may echo these phenomena using patterns, repetition and tonality. Even today, some cultures have certain instances of their music intending to imitate natural sounds. In some instances, this feature is related to shamanistic beliefs or practice. It may also serve entertainment (game) or practical (luring animals in hunt) functions. According to Easton's Bible Dictionary, Jubal was named by the Bible as the inventor of musical instruments (Gen. 4:21). The Hebrews were much given to the cultivation of music. Their whole history and literature afford abundant evidence of this. After the Deluge, the first mention of music is in the account of Laban's interview with Jacob (Gen. 31:27). After their triumphal passage of the Red Sea, Moses and the children of Israel sang their song of deliverance (Ex. 15). But the period of Samuel, David, and Solomon was the golden age of Hebrew music, as it was of Hebrew poetry. Music was now for the first time systematically cultivated. It was an essential part of training in the schools of the prophets (1 Sam. 10:5). There now arose also a class of professional singers (2 Sam. 19:35; Eccl. 2:8). Solomon's Temple, however, was the great school of music. In the conducting of its services large bands of trained singers and players on instruments were constantly employed (2 Sam. 6:5; 1 Chr. 15:16; 23;5; 25:1-6). In private life also music seems to have held an important place among the Hebrews (Eccl. 2:8; Amos 6:4-6; Isa. 5:11, 12; 24:8, 9; Ps. 137; Jer. 48:33; Luke 15:25). "While Genesis 4.21 identifies Jubal as the “father of all such as handle the harp and pipe,” the Pentateuch is nearly silent about the practice and instruction of music in the early life of Israel. Then, in I Samuel 10 and the texts which follow, a curious thing happens. “One finds in the biblical text,” writes Alfred Sendrey, “a sudden and unexplained upsurge of large choirs and orchestras, consisting of thoroughly organized and trained musical groups, which would be virtually inconceivable without lengthy, methodical preparation.” This has led some scholars to believe that the prophet Samuel was the patriarch of a school which taught not only prophets and holy men, but also sacred-rite musicians. This public music school, perhaps the earliest in recorded history, was not restricted to a priestly class--which is how the shepherd boy David appears on the scene as a minstrel to King Saul." The prehistoric era is considered to have ended with the development of writing, and with it, by definition, prehistoric music. "Ancient music" is the name given to the music that followed. The "oldest known song" was written in cuneiform, dating to 4,000 years ago from Ur. It was deciphered by Prof. Anne Draffkorn Kilmer (University of Calif. at Berkeley), and was demonstrated to be composed in harmonies of thirds, like ancient gymel, and also was written using a Pythagorean tuning of the diatonic scale. Indian classical music (marga) can be found from the scriptures of the Hindu tradition, the Vedas. Samaveda, one of the four vedas, describes music at length. The history of musical development in Iran (Persian music) dates back to the prehistoric era. The great legendary king, Jamshid, is credited with the invention of music. Music in Iran can be traced back to the days of the Elamite Empire (2,500-644 B.C). Fragmentary documents from various periods of the country's history establish that the ancient Persians possessed an elaborate musical culture. The Sassanid period (A.D. 226-651), in particular, has left us ample evidence pointing to the existence of a lively musical life in Persia. The names of some important musicians such as Barbod, Nakissa and Ramtin, and titles of some of their works have survived. The term Early music era may also refer to contemporary but traditional or folk music, including Asian music, Persian music, music of India, Jewish music, Greek music, Roman music, the music of Mesopotamia, the music of Egypt, and Muslim music. Early music is a general term used to describe music in the European classical tradition from after the fall of the Roman Empire, in 476 AD, until the end of the Baroque era in the middle of the 18th century. Music within this enormous span of time was extremely diverse, encompassing multiple cultural traditions within a wide geographic area; many of the cultural groups out of which medieval Europe developed already had musical traditions, about which little is known. What unified these cultures in the Middle Ages was the Roman Catholic Church, and its music served as the focal point for musical development for the first thousand years of this period. Very little non-Christian music from this period survived, due to its suppression by the Church and the absence of music notation; however, folk music of modern Europe probably has roots at least as far back as the Middle Ages. Portrait of Italian composer Claudio Monteverdi in Venice, 1640, by Domenico Fetti. Instrumental music became dominant in the Baroque, and most major music forms were defined. Counterpoint was one of the major forces in both the instrumental and the vocal music of the period. Although a strong religious musical tradition continued, secular music came to the fore with the development of the sonata, the concerto, and the concerto grosso. Much Baroque music was designed for improvisation, with a figured bass provided by the composer for the performer to flesh out and ornament. The keyboard, particularly the harpsichord, was a dominant instrument, and the beginnings of well temperament opened up the possibilities of playing in all keys and of modulation. Much Baroque music featured a basso continuo consisting of a keyboard, either harpsichord or organ (sometimes a lute instead), and a bass instrument, such as a viola da gamba or bassoon. The three outstanding composers of the period were Johann Sebastian Bach, George Frideric Handel, and Antonio Vivaldi, but a host of other composers, some with huge output, were active in the period. Along with the gradual displacement of the voice in favor of stronger, clearer melodies, counterpoint also typically became a decorative flourish, often used near the end of a work or for a single movement. In its stead, simple patterns, such as arpeggios and, in piano music, Alberti bass (an accompaniment with a repeated pattern typically in the left hand), were used to liven the movement of the piece without creating a confusing additional voice. The now-popular instrumental music was dominated by several well-defined forms: the sonata, the symphony, and the concerto, though none of these were specifically defined or taught at the time as they are now in music theory. All three derive from sonata form, which is used to refer both to the overlying form of an entire work and the structure of a single movement. Sonata form matured during the Classical era to become the primary form of instrumental compositions throughout the 19th century. The 20th Century saw a revolution in music listening as the radio gained popularity worldwide and new media and technologies were developed to record, capture, reproduce and distribute music. Music performances became increasingly visual with the broadcast and recording of music videos and concerts. Music of all kinds also became increasingly portable. Headphones allowed people sitting next to each other to listen to entirely different performances or share the same performance. Classical music is a broad, somewhat imprecise term, referring to music produced in, or rooted in the traditions of art, ecclesiastical and concert music. A music is classical if it includes some of the following features: a learned tradition, support from the church or government, or greater cultural capital. Classical music is also described as complex, lasting, transcendent, and abstract. In many cultures a classical tradition coexisted with traditional or popular music, occasionally for thousands of years, and with different levels of mutual borrowing with the parallel tradition. Ancient Iranians attached great importance to music and poetry, as they still do today. 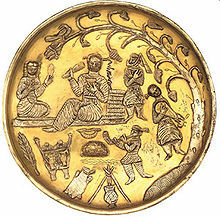 7th century plate depicts Sassanid era musicians. The British Museum. Greek written history extends far back into Ancient Greece, and was a major part of ancient Greek theater. In ancient Greece, mixed-gender choruses performed for entertainment, celebration and spiritual reasons. Instruments included the double-reed aulos and the plucked string instrument, the lyre, especially the special kind called a kithara. Music was an important part of education in ancient Greece, and boys were taught music starting at age six. Greek musical literacy created a flowering of development; Greek music theory included the Greek musical modes, eventually became the basis for Western religious music and classical music. Later, influences from the Roman Empire, Eastern Europe and the Byzantine Empire changed Greek music. 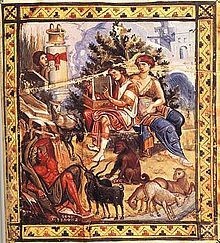 The connection of the music environment of Greece with that of the European Renaissance can be traced mainly in Crete until 1669, where its vivid urban music benefited from the creative assimilation with the venetian culture. The most important musical figure of Crete was Fragiskos Leondaritis (Francesco Leondariti or Londariti), organist and composer of sacred and secular music. Another key-figure of that era was Ieronimos o Tragodistis (Hieronymus the Chanter), a Cypriot student of Gios. Zarlino, who flourished around 1571 and, among others, proposed a system that enabled medieval Byzantine chant to correspont to the current contrapuntal practices via the cantus firmus paraphrase. In the 18th century art music was mainly cultivated in Ionian Islands, where from 1733 opera became the most distinctive music genre. This dynamic had as a consequence in 19th century, composers like Nikolaos Mantzaros (Niccolo Calichiopulo Manzaro, 1795 - 1872), Spyridon Xyndas (1812 - 1896), Pavlos Karrer (Paolo Carrer, 1829-1896) and Spyridon Samaras (1861 - 1917) to revitalize Greek art music. 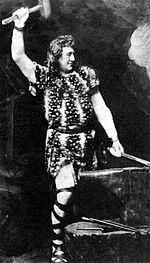 Instrumental music was also cultivated in 19th century by composers, such as Dionysios Rodotheatos from Ithaca and Dimitris Lialios from Patras, both of them adopting the -with the broader sense-wagnerian novelties in the style and aesthetics. In the first decade of 20th century, the social and historical conditions enabled the revisiting of nationalism in music by the composers of the so-called 'National School'. The prevailing current for 'national music' was that of Manolis Kalomiris, which eventually became wider accepted compared to that of Georgios Lambelet. 'National School' succeeded in concentrating under its aesthetic 'credo' composer with different backgrounds, such as Marios Varvoglis, Petros Petrides, Dimetrios Levidis, Aimilios Riadis or Antiohos Evagellatos. On the other hand, modernism made also its appearance with Nikos Skalkottas, a student of Arn. Schoenberg, being the most notable (and at the same time, neglected) representative. Dimitris Mitropoulos also contributed to the music literature of Greek modernism before committing himself to conducting. After the Second World War modernism began to prevail, with considerable difficulty, mainly because of the social and political conditions of the postwar period in Greece, as well as the dominance of the 'National School'. However, composers like Mihalis Adamis, Thodoros Antoniou, Iannis Xenakis, Y.A. Papaioannou and Janni Christou succeeded in giving new perspectives to such aesthetic ways. In the maintime, a strong current of populism related to the political conditions especially after 1949, as well as to the brief change of taste of the urban class and the initiation of the touristic enterprise in 1960s, enabled the gradual promotion of the popular song as the prevalent form, which the last decades has regretably become synonymous to 'Greek music', as a whole. ^ Wilford, John N. (June 24, 2009). Flutes Offer Clues to Stone-Age Music. The New York Times. doi:10.1038/nature07995. http://www.nytimes.com/2009/06/25/science/25flute.html. Retrieved June 29, 2009. Bangayan, Phil, Bonet, Giselle and Ghosemajumder, Shuman (2002) Digital Music Distribution (History of the Recorded Music Industry), MIT Sloan School of Management. This article is licensed under the GNU Free Documentation License. It uses material from the Wikipedia article "History of music". Allthough most Wikipedia articles provide accurate information accuracy can not be guaranteed.